The skill diagnostics (Fig. 2; see also Dataset S4) for the validation experiments indicate that both the CPS reconstructions (with the screened network) and EIV reconstruction (with the full network) produce skillful NH land reconstructions back to A.D. 400. When tree-ring data are eliminated from the proxy data network, a skillful reconstruction is possible only back to A.D. 1500 by using the CPS approach but is possible considerably further back, to A.D. 1000, by using the EIV approach. We interpret this result as a limitation of the CPS method in requiring local proxy temperature information, which becomes quite sparse in earlier centuries. This situation poses less of a challenge to the EIV approach, which makes use of nonlocal statistical relationships, allowing temperature changes over distant regions to be effectively represented through their covariance with climatic changes recorded by the network. It should be noted that the normal temperature increase for the last century used to be about 0.6 degrees per century (for instance Folland et al 2001). What also seems to be strange is the increasing deviation between those temperature records and the reconstruction, staying clearly behind in the last part of the graph. Now see what happens if we remove those recorded temperatures. So it would be interesting to see where that 1.3 range comes from. Virtual identical rehash of the same thread you tried a couple months ago. The larger range comes from the difference in phase and temporal resolution of reconstructed proxy data which often spans decades and longer as compared to actual time and high resolution temperature readings. The hockey stick profile has been confirmed by nearly every organization that has examined the data, even its early objective skeptics which had some technical issues with the first analysis because of the huge amount of data that now reinforces it. The only room for doubt is the sparse data in the Southern Hemispshere--but even that is improving. Its denial is almost a litmus test for illegitimacy—where you see the hocket stick denied, you can almost be certain there won’t be objectivity. This is so incredibly hypocrite. THINK. man THINK!! before running the automayic propaganda tune. This new hockeystick overrides the old one, meaning that the old one was wrong and that the builders admit it to be wrong. Compri? You're not even addressing the point about temporal resolution and phase lag of proxy data compared to real time observation. Instead you change the subject (once again), and overstate the importance of a poor correlation between temperature and Co2 concentration while deliberately not mentioning that the entire range of Co2 during the period was less than 20 ppmv. Given the narrow range of Co2, it would have been surprising to find a good correlation. Other factors such as methane concentrations and solar variation, for example, were also playing a role--as they always have and still do. This compares to the more than 100 ppmv increase since the onset of the industrial revolution. At that level of change (+40%) since the onset of the industrial age we start to see the good correlations between Co2 and surface temperature. With projections of +200% above pre-industrial levels of Co2 in the decades ahead, even including feedbacks, Co2 becomes increasingly important and overwhelms other factors-hence the whole point of concern about the future. Your post smacks of deliberately presenting a favorite false dichotomy of climate skeptics that suggest that temperature as either entirely due to Co2 or not at all. No credible climatologist shares this view. Co2 is one of many factors that effect temperature but one that's becoming more important as we continue to pump carbon from fossil fuels into the atmosphere. Andre, do you work for an oil company or something? 1 Illusions of invulnerability creating excessive optimism and encouraging risk taking. 2 Rationalising warnings that might challenge the group's assumptions. 3 Unquestioned belief in the morality of the group, causing members to ignore the consequences of their actions. 4 Stereotyping those who are opposed to the group as weak, evil, disfigured, impotent, or stupid. 5 Direct pressure to conform placed on any member who questions the group, couched in terms of "disloyalty". 6 Self censorship of ideas that deviate from the apparent group consensus. 7 Illusions of unanimity among group members, silence is viewed as agreement. 8 Mindguards — self-appointed members who shield the group from dissenting information. Oh come on Andre! Are you really going to try and hide behind your little list? You behave exactly like someone that works for an oil company. Someone whose job it is to spread propaganda against global warming. That is not to say you are necessarily such a person, but even you have to admit that your behaviour could be seen that way through no fault of their own. Your rantings have been entirely unconvincing and emotional. In fact, you have been more guilty of your list than anyone else. There no discussion about the cult, just about the person attacking it. Care to read some older threads of mine here? I'm not addressing anything. Van Hoof et al 2008 and Mann et al 2008 are addressing things. I merely show that their work don't add up. Instead you change the subject (once again), and overstate the importance of a poor correlation between temperature and Co2 concentration while deliberately not mentioning that the entire range of Co2 during the period was less than 20 ppmv. This compares to the more than 100 ppmv increase since the onset of the industrial revolution. At that level of change (+40%) since the onset of the industrial age we start to see the good correlations between Co2 and surface temperature. No credible climatologist shares this view. Because of the arcane nature of science, it's easy to trash scientists. Imagine a 1940 congressional hearing to discredit Einstein. "This man actually believes the faster you drive, the slower your watch runs. Mr. Einstein, then why weren't you here yesterday?" The public, listening on radio, immediately concludes this Princeton weirdo is just another academic egghead. End of reputation. I'm not addressing anything. Van Hoof et al 2008 and Mann et al 2008 are addressing things. You're still completely avoiding the question about phase lag of proxy data--which is what you started this thread about. So what's your point? 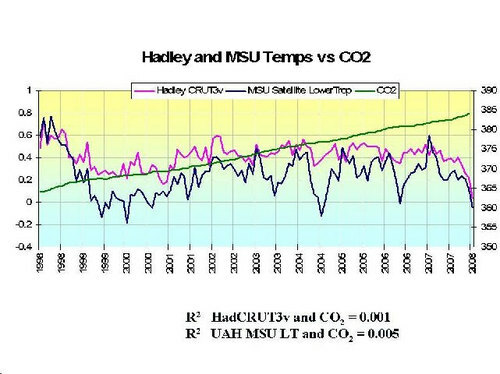 The Van Hoof et at 2008 graph makes nearly the exact point I already stated, you aren't likely to see Co2 correlations in low % changes--we don't see it during the middle ages because it's mostly washed out by other effects, and we don't see it within the short one-sun spot cycle of the past ten years or so. All you've done is confirmed what I've already said. When you look at longer periods and much more of a change of Co2, the signal is much more clear and predicted to become completely dominant in the next decades as we double and triple its concentration above pre-industrial levels. Another strawman, nowhere in the opening post is any mentioning of phase lag of proxy data, but I'm happy that you are so kind to make my day. I'm not sure how many times we have gone over the the fact that CO2 is lagging assumed temperature changes in all records and proxies. So Please do produce any evidence that CO2 is leading temperature changes to make a case for CO2 causing temperature changes. Now it would even be more fun if positive feedback was to be mentioned. Now from here there are two obvious choices: either admit that natural variation outweigh the effect of concentration changes of radiative gasses or admit that AGW is no science, since no evidence against it can disprove it. Hence AGW is not falsifiable. Why present the false dichotomy again? It's not a matter of EITHER natural variation or AGW driving temperature change...it's a matter of degree of attribution. No atmospheric scientist claims those natural variations ever go away--your presentation is about as wrong as it gets. The lower the concentration of Co2, the higher are the proportional change from other temperature forcing--enough to mask small changes from the the Co2 signal. In the same way those other variations tend to create a positive feedback into Co2 concentrations--this isn't some mystery, surprising, or provide any reason to doubt the science: We even see it in the annual seasonal variation as well as the in the long term record where astronomical forcing and Co2 forcing tend to boot strap temperture until there's much large amplitude in temperature between ice age and interglacial periods than simple astronomical forcing can account for. Again no mystery. At 2x and 3x preindustrial levels in less than a century, Co2 becomes much more important and far larger than any other known change in natural forcing. Much to the discredit of the skeptics, not ones even proposing another forcing mechanism that will be anything close to Co2 change forcing, not even for small changes of the past 120 years--it says alot about the weakness of their arguments. Ironically, even at those future high levels, when our children are becoming grey and the planet 2-5C warmer, the subtle + or - 10% or so Co2 changes probably still won't be the dominent short term variations in temperature--they'll still be able to make the false argument you're trying to make which completely ignore the fundamental issues. But that's what the public likes hear and shiver about so the real science is chanceless. There is at most some evidence that the CO2 in the atmosphere will increase with ~100 ppm, lagging a few hundred years if the global temperature would increase with ~10 degrees. That is if the isotope interpretation of the ice cores is correct. But this is simply false, proven by big herds of extinct mammoths and horses who roamed the lush productive grassy steppes in northernmost Siberia around the last glacial maximum and the ultra cold(?) Younger Dryas. Look where those steppes are nowadays, not in North Siberia, which is high artic tundra now, supporting one musk ox per 10km2 at the most. Those steppes are in Mongolia or the prairies in North America, some 20 degrees lower in latitude. If you can explain how moderate climate steppes moved northwards to the arctic while the temperatures were about 10 degrees lower than today, then you are in business. Right now these ice ages claims with temperatures and CO2 are short sighted madness. Which fallacy Andre? You mean the one that proxy temp data which includes things like plant layers in the mud, deep underground bore holes, and other forms of proxy data don't respond as quickly compared to the real time temperature observations? LOL. Much of the proxy data lags or dampens surface temperatures compared to direct measurement--it's not a fallacy--it's simple physics. You made a poorly constructed post based on flimsy comparison between high resolution actual temperature measures and lower resolution data reconstructions trying to present the expected difference as somehow surprising. It's a silly argument that completely ignores the differences between how the temp is derived. Or do you mean the "fallacy" that natural variations will still exist and is more relatively more important when Co2 concentrations were much lower, or when only looking at small changes in Co2 concentrations? LOL. You’re the only one here making the illogical claim by your arguments that temperature change is either natural or pure AGW induced--completely ignoring that there's an entire spectrum of relative forcing importance and feedbacks in between those two extremes. I can see why you're trying to change the subject from your original posting in this thread. Glad to address the other topics as we get to them, but not when they're deliberately added to the same thread to side step the discussions already at hand. Perhaps you should start another thread titled "the year we'll hit +100 PPMV of Co2." Which would be funny given we're just about there already and know where it come from. Which fallacy Andre? You mean the one that proxy temp data which includes plant life's slow adaptations to latitude and elevation movements, bore holes from deep underground, and other forms of proxy data don't adjust or lag the real time temperature observations? LOL. Much of the proxy data lags and dampens surface temperatures--it's not a fallacy--it's simple physics. No it is still a fallacy, affirming the consequent, If A then B, B hence A. Or in mathematical terms working with more variables than there are equations. And certainly the choices of filling in the variables are always based on CO2 is climate supposition. And since that is flat out wrong, it's inevitable that things don't add up in the end.